Co-existent application of Process Abstraction, State Repository, Process Centralization, and Compensating Service Transaction, and can be further extended with Atomic Service Transaction, Rules Centralization, and Data Model Transformation. An orchestration platform is dedicated to the effective maintenance and execution of parent business process logic. Modern-day orchestration environments are especially expected to support sophisticated and complex service composition logic that can result in long-running runtime activities. 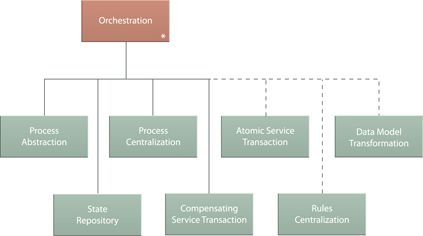 Orchestration is fundamentally comprised of the co-existent application of Atomic Service Transaction, Compensating Service Transaction, Data Model Transformation, Process Abstraction, Process Centralization, Rules Centralization, State Repository.